Roman soldiers were very common in the early days of the church. The Roman Empire flexed its power by showing force through the occupying armies throughout the land reminding its subjects who ruled over them. Ephesus was located in Asia Minor and while a city of great nobility, it required the presence of an armed force to insure law and order. Drawing upon the image of the Roman soldier, Paul describes the warfare of God’s people as fighting against huge numbers of evil forces such as principalities, powers and rulers of the darkness of the age. Satan threw a formidable foe against the saints of the Lord. With this in mind, the apostle uses the Roman military fighting garment as a spiritual application to fight against the wiles of the devil. Each part of the Roman armor was an integral part of the protection of the soldier. No piece was less important than the other was as each one is dependent upon the design of each part. The helmet of the soldier was as vital as any other piece of armor because if the head takes a crushing blow the battle is over. It also identified the soldier to the army it belonged so that all could see whose side the soldier was loyal. Paul describes the helmet of the Christian as the character of salvation. Truth is girded about the waist with righteousness embracing the heart as a breastplate. The feet are clothed in the power of the gospel. Faith is found as a shield protecting the soldier of Christ from the fiery darts of the evil one. With prayer the battle is engaged with the sword of God’s word casting down all arguments against the will of God. It is in the helmet the focus of the Christian’s life is described. The head must be protected as the seat of knowledge. In this knowledge is the means to engage in a spiritual war against Satan. The head is where the brain processes information making decisions in a split second. With the eyes, the soldier is able to see clearly the battle in front of him. Hearing is key to survival as he hears danger approaching. With the mouth the soldier is able to voice commands and exhort his fellow soldiers to fight on. The helmet of salvation contains all the elements of the soldier’s purpose in battle. It protects the mind from the doubts, fears and assaults of the devil to dissuade the child of God from fighting. Paul tells the Thessalonians the helmet is the hope of salvation. Satan is adamant in trying to cause uncertainty in the hearts of God’s people. The hope of salvation is the blessed assurance possessed by the mind of the Lord’s soldier the battle is won – victory is guaranteed. Hope is the focus of the soldier of Christ. He lives for the coming of Christ knowing he is saved. The helmet protects the eyes so the child of God can see clearly where he is fighting and how to defeat Satan. It also protects the ears and mouth so that at the sound of trouble the child of God will turn and face the devil head-on destroying him with the sword of God’s word. Christians exhort one another to fight on because of the hope they possess in Christ. The helmet is their salvation. The helmet of salvation will be removed one day when the soldier of Christ goes home. In its place will be a crown. Hope is where the Christian finds his strength to fight. 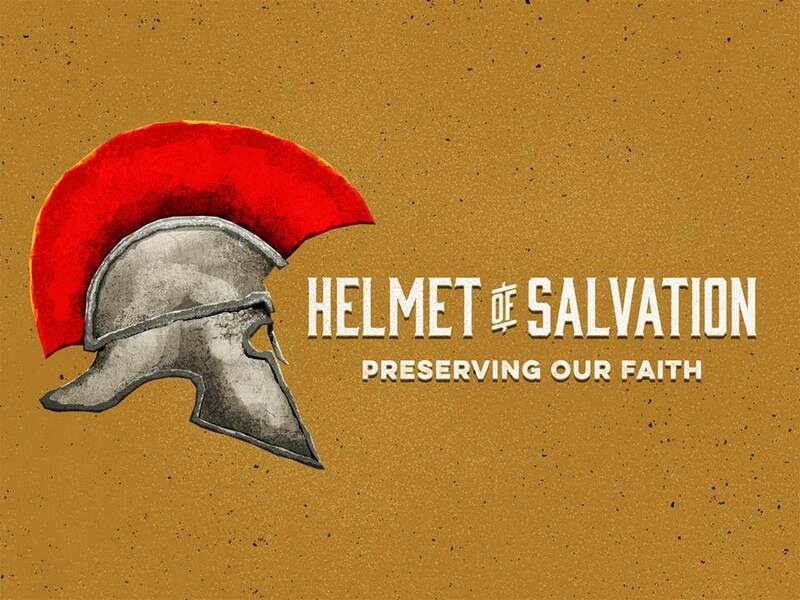 The helmet of salvation is living each day with the knowledge that God has promised eternal life to the child of God. Heaven is not a maybe. Eternal life is real. Fighting each day against the forces of Satan can only be possible when we look through the visor of the helmet encircling our head knowing victory has been made sure by the power of Christ. Death has no sting and the grave has no victory. The hope of salvation is our assurance in the promises of God.